Boo went to her first 1st birthday party today. A good friend of ours, Alicia, turned one. 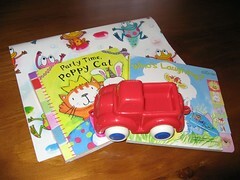 We gave her a lovely Poppy Cat book, a Suzy's Zoo book and a red car. She loved everything and drove the red car all over the house - big hit!